Bethel and their ‘apostolic grave-sucking culture’ still continues. Home › Uncategorized › Bethel and their ‘apostolic grave-sucking culture’ still continues. 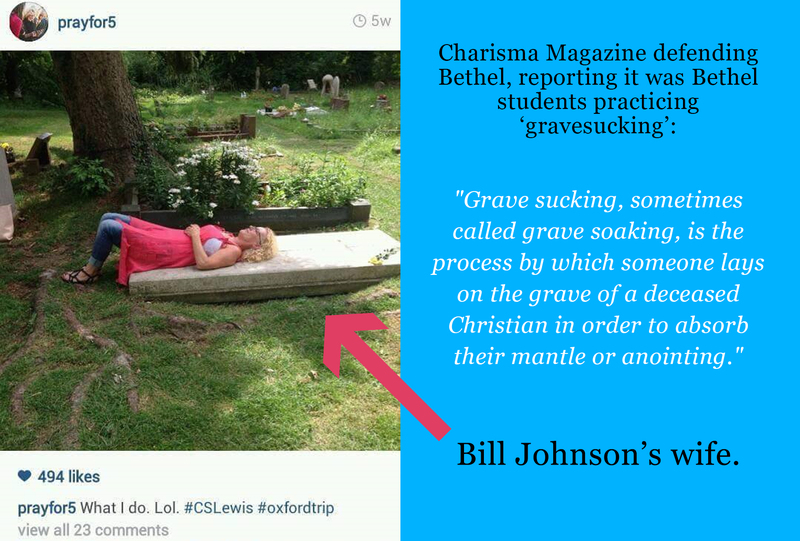 ‘Grave-sucking, or ‘grave-soaking’, is a process by which someone lays on the grave of a deceased Christian in order to absorb their mantle or anointing.’ According to Apostle Bill Johnson’s wife Beni Johnson, grave-sucking is ‘what I do’. In other words, this occultic practice is promoted from the top down, not from the bottom up. It should come as no surprise that just as we see in the culture of Bethel from the top down, to access this ‘glory’ and supernatural power of ‘Holy Spirit’, Jeff Jansen engages in grave-sucking. Below is the video Jeff Jansen uploaded up on his Facebook wall, where he’s seen sucking up William Branham’s ‘anointing’ to supposedly ‘impart’ this ‘power’ to people. Why would Jansen be proud to receive an ‘impartation’ from William Branham, the man responsible for helping birth one of the worst doomsday cults on the planet, resulting in the deaths of hundreds of people at Jonestown? It was William Branham’s false theology and ‘prophetic’ writings that strongly influenced cult-leader and murderer Jim Jones. And what does Bill Johnson have in common with William Branham? They are both recognised as ‘fathers’ in both the New Order of the Latter Rain and the New Apostolic Reformation. What’s unsettling about all this, just as those who never questioned the cult leader Jim Jones, it seems few will question the ‘apostolic’ ministries of Bill Johnson and Jeff Jansen. While we don’t suggest that Johnson or Jansen will ‘murder’ their followers, ultimately unless they and their gullible followers repent of the ‘Kool-Aid’ they distribute, they will be spiritually destroyed. ‹ Seven threats from a false teacher.